← a whole new year! 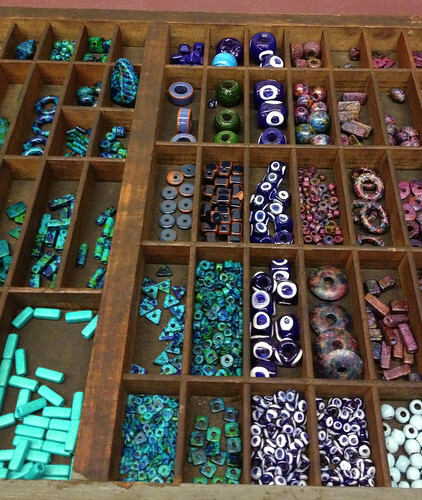 I might have just opened an art bead shop at Crafted at the Port of Los Angeles. 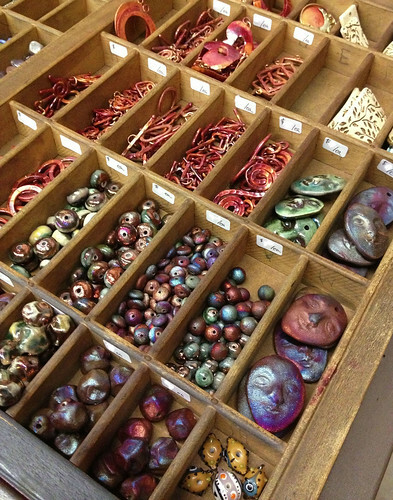 We’ve got some great bead artists in the shop, including… Heather Powers/Humblebeads, Patricia Healey, Amy Mealey/Xaz Beads, Shirlee Yantz/Enchanted Chic, Elaine Robitaille/Too Aquarius, and Raida Disbrow/Havana Beads to start. While the emphasis at Six Bad Cats Art Beads & Yarn is totally on the handmade and artisan quality supplies, we are offering a few things on the non-handmade side. We’re working up a fairly wide selection of affordable ceramic beads in every hue from Mykonos (these look GREAT in art jewelry!) and also a bunch of fun Czech glass accent beads for your creations. I’m a big fan of the more earthy hues in those, and that great picasso finish. We eventually also plan to sell waxed Irish linen in every color we can find, hand dyed sari ribbon, and other fun textiles to include in your beaded creations. This list is just going to keep expanding as I get more orders made and talk to more artists. Eventually you’ll be able to find some fun and interesting gemstones, plus a nice selection of handmade earwires, headpins, closures and clasps in sterling, copper and bronze by ME. Those will be coming along shortly, not in stock yet. 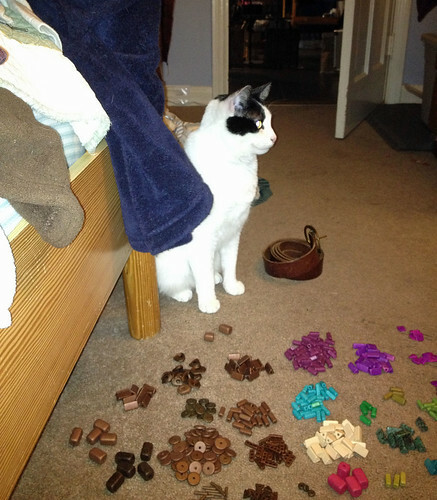 This is my studio assistant, ignoring temptation helping me count beads. She was helping, of course, by ignoring temptation. Because you need good help to run a bead shop these days. This entry was posted in Crafted at the Port of LA and tagged art beads, bead shop, bead store, Crafted. Bookmark the permalink. 5 Responses to This is a little bit exciting. I’ll start by saying that I still love seeing that re-purposed letter tray arrangement that you have going. (Major yay, from a graphic artist who was trained by one of the ‘dinosaurs’ of the industry who actually worked with lead type) Then, I’ll follow up with an admiring, avaricious croon for the trinket in the second bead-tray photo, left section, fourth column, second row (large blue and black stone). Do you still have it? May I ask it’s precious price? And may i have? ::fingers twitching:: And your sorting assistant was being very self-restrained with oh so many tempting play things!! You’re off to a fantastic start with this addition to your shop, Rain! IT’s actually a blue and dark blue focal in the shape of a leaf. Ceramic, not stone. Those are all ceramic beads from Mykonos! I am sooooo very excited for you. Your beads look amazing. Now I will I was nearby to come and play.